Carl Sandburg – Let's Go RVing! Wow – were we worn out today? Yesterday was more draining than we realized I guess. We got up and out a lot earlier today though and headed for Saluda. It is a nice small town with some stores. We shopped at Thompson’s Grocery which carries the title of the oldest grocery store in – well, I’ll have to look at the picture to finish that phrase. We bought some corn on the cob, some onion relish and some starter for vegetable soup. Don’t know how that will taste but it might come in handy on a cool night. 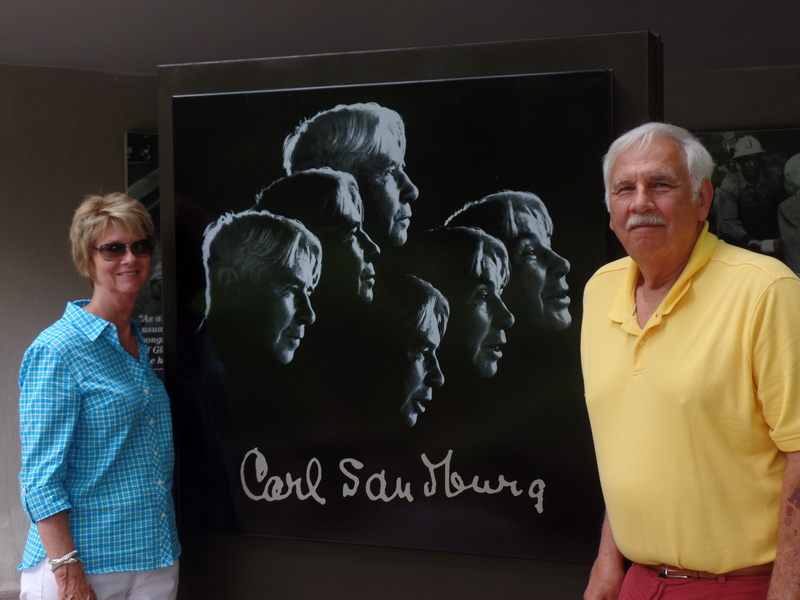 We walked in and out of several stores and then headed back to Flat Rock to the Carl Sandburg House. Gypsy sent us on another wild goose chase but we eventually made it. As soon as we got in the park and found some benches we sat down and ate our sandwiches so Jerry could take the cooler back to the car before we went to the house. We stopped on the bridge going over and of all things watched the snakes in the river. Yuk! There were plenty too! Jerry even saw a rattlesnake on the way back. Of course we are in the mountains so everything is up hill. Although I am not as sore as I thought I would be today my calves still hurt some when going up and down. Fortunately there were no steps, just hills. Our first stop was the goat barn. 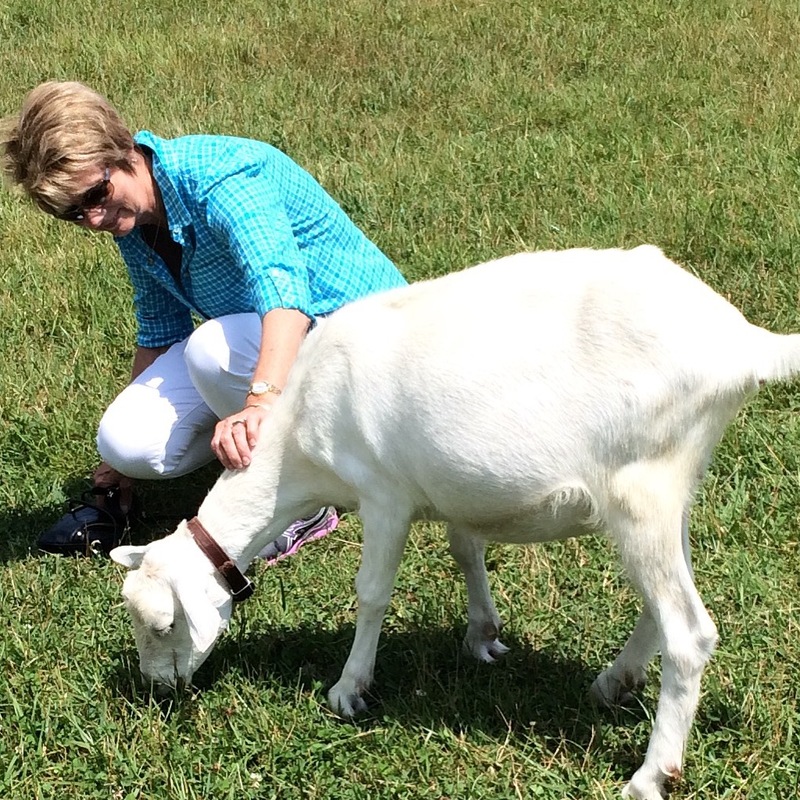 Mrs. Sandburg raised goats in Michigan and very happily relocated them to North Carolina having upwards of 200-300. She won many prizes with them and was the first president of the American Goat Association. There are only 15 there now and they keep that number constant each year. They really were quite cute and very friendly. I was amazed that we could rub them and pat them. After a thorough hand washing we went up to the house. Although there was a walking tour of all of the buildings on the property we elected not to participate in that. Perhaps another day! We went through the tour of the house which has had many of the furnishings and books removed, archived and stored. The house was built in 1938 and there has not been any work on it since then. They are not planning to change the structure at all but will shore up the floors and hopefully be opened fully in a couple of years however it will not close at any time even with no furniture. The guide said she had no idea what she would talk while it was empty of furniture. We walked on back to the car and then decided to stop in Flat Rock since they were having a festival of some sort. We were able to park at the post office right across the street so it was easy to get there. It was an ice cream festival and they were selling ice cream and doing face painting. There was a good band playing and lots of people there but no local vendors plying their wares. We were only there a few minutes and then headed out. Our next stop was Bloomfield’s, a nice store with a lot of everything! We ended up buying two corn holders, should have gotten two more. I also found two small lotus bowls. We came on back to the coach as we wanted to be back in plenty of time to watch the Belmont. We put out chairs and settled down to read. Jerry turned the outside TV on and then a gentleman stopped by and we chatted for a good while. By that time the Dereby pre-show had started so Jerry came on in and I stayed outside to watch it however the glare was so bad I gave up and came inside. I got in the recliner and took a short nap and then we watched history being made as American Pharoah became the first Triple Crown winner in 37 years. What a thrill that must be for all. We cooked dinner then, beef stroganoff and corn on the cob. I was hoping to walk after dinner but just before we finished eating it began to sprinkle and it only got harder so no walk today. Unfortunately the awning is out and so are the chairs although they are under the awning – if it doesn’t close! Looks like an early night which will be good since I didn’t sleep well last night ending up on the sofa wrapped up in a blanket!